Pakistani forces had their best chance of capturing Osama Bin Laden last year, but they lost the trail, President Pervez Musharraf has told the BBC. Gen Musharraf said the intelligence services had their strongest indication about the al-Qaeda leader's whereabouts eight to 10 months ago. He said the "dragnet had closed" along the border with Afghanistan, but Bin Laden fled. Bin Laden last appeared on video just before the US election in November. He appeared in good health in the video, in which he threatened fresh attacks on the US, whoever was elected, but it was not clear when it was recorded. Bin Laden and his deputy, Ayman al-Zawahri, are widely believed to have been hiding in the mountains along the Pakistan-Afghanistan border since US-backed forces toppled Afghanistan's Taleban regime in late 2001. Pakistan has been a staunch ally of the US since 11 September 2001, although Pakistani officials have criticised the US for not putting more resources into capturing Bin Laden. US Secretary of State Condoleezza Rice is due to visit Pakistan later this week. President Musharraf told the BBC his forces got their clearest trace of Bin Laden after the Pakistani army launched an offensive in the tribal region last year. "There was a time when the dragnet had closed and we thought we knew roughly the area where he possibly could be. That was, I think, some time back, not very long... maybe about eight to 10 months back," he said. "But after that, this is such a game, this intelligence, that they escape. They can move and then you lose contact." 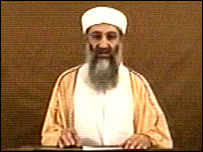 Bin Laden's group is blamed for thousands of deaths in the 11 September 2001 attacks on the US and other attacks around the world. The Pakistani army has faced its strongest resistance in its operations against al-Qaeda in the restive border regions of North and South Waziristan. President Musharraf said he was sure Pakistan's most wanted militant, Abdullah Mehsud, was killed in North Waziristan several days ago. The death has yet to be confirmed, he said, adding that the militant's death would reduce resistance to the army's presence. Mehsud - whose real name is Noor Alam - is a Pashtun, the same ethnic group as the Taleban. In December, Pakistani authorities offered a five million rupee ($84,000; £44,000) reward for help in the arrest of Mehsud. The one-legged Mehsud, a former prisoner at the US military base in Guantanamo Bay, Cuba, was accused of masterminding the kidnap of two Chinese engineers last October.